I just received an email notification that a transfer request had been denied on an offender, but our compact office hasn't sent the rejected transfer reply to the sending state yet. This type of notification is only sent to the compact Office designee to alert your state that a denied TREP has been submitted by the field to the compact office. 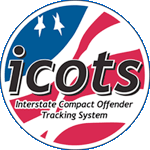 ICOTS sends this notification to the compact office designee account so someone is aware that the case does require attention in case the rejection or acceptance is in error and needs to be returned to the field. The text of this email may be a little deceiving because similar notifications are sent to the sending state compact office designee when a TREP is denied or accepted by the receiving state. But this email notification does not indicate that the transfer request has been 'fully' rejected or accepted by the receiving state yet, only that the field has submitted a denied or accepted TREP to the compact office.